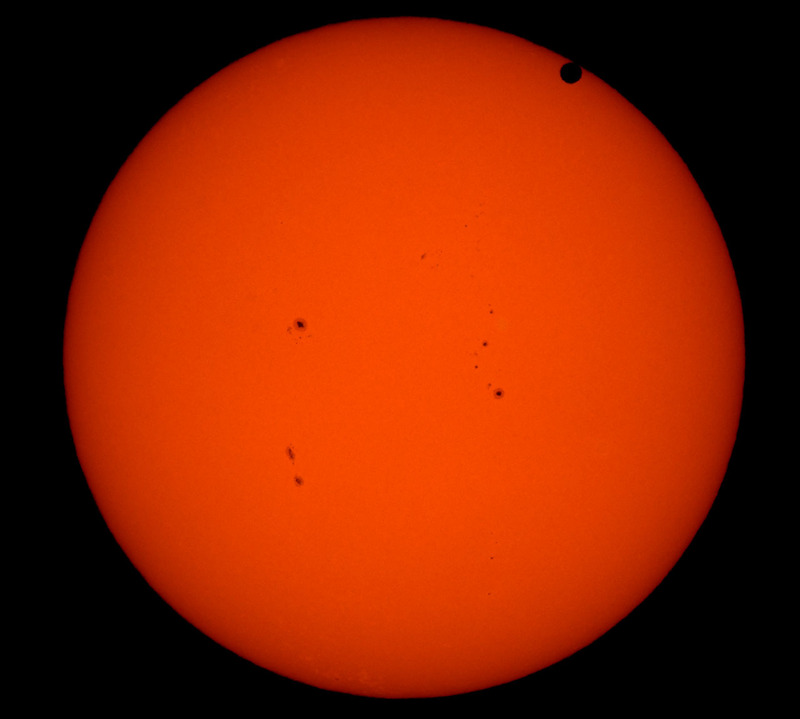 The Venus transit across the Sun on 6/5/2012 was well-photographed by professional and amateur astrophotographers alike. 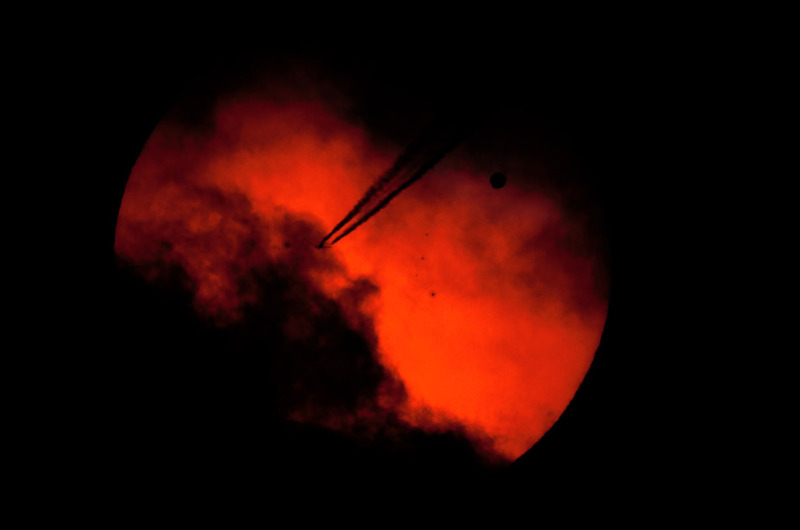 Several imagers captured a plane crossing along with Venus. This image captures both the transit and a jet plane plus contrails crossing the sun (scroll the picture to the right of you don't see it). Initially I thought Venus was obscured by clouds on this frame, but a close look & subsequent processing in Photoshop reveal the planet is indeed present in the frame! Nikon D7000 camera, 1/160s at ISO 200, Takahashi TOA 130 Telescope (a 5" APO refractor) with Tak 1.6 extender for 1600mm focal length, Thousand Oaks solar filter, AP 900GTO mount, from the pond near Kuykendahl & Lake Woodlands, The Woodlands TX. 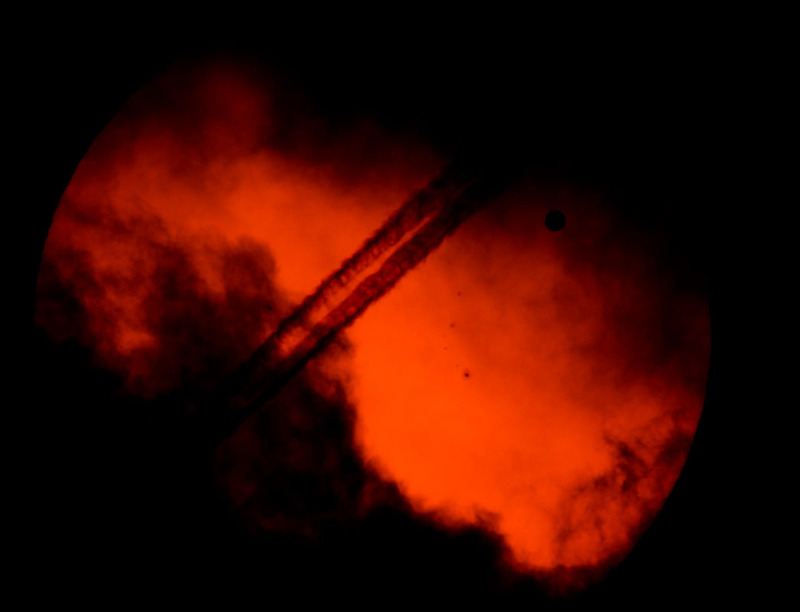 Danilo Pivato also caught a nice image of a plane during the transit; link here. Allan Hall caught a plane in this one. 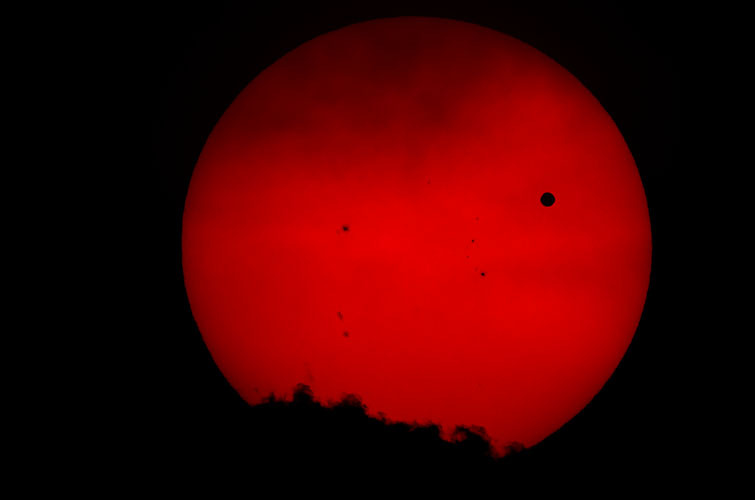 The next transit is in 2177, so this was truly the last chance to see this in our lives. This article has an interesting discussion all about the time dimension of the transit. Image details: 1/640s, Nikon D7000 camera, Takahashi TOA 130 Telescope (a 5" APO refractor) with Tak 1.6 extender for 1600mm focal length, Thousand Oaks solar filter, AP 900GTO mount, from the pond near Kuykendahl & Lake Woodlands, The Woodlands TX. There were a fair amount of clouds; I shot this one when the Venus was well inside the Sun's disk. 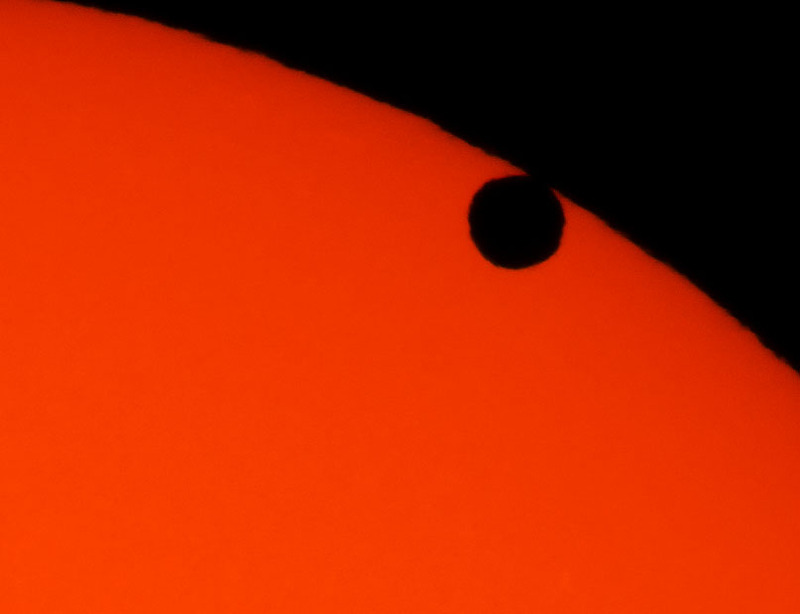 This one shows a cloud-obscured Venus transit a moment after a jet flew across the sun's face. Last good shot before the Sun set into a cloud bank! 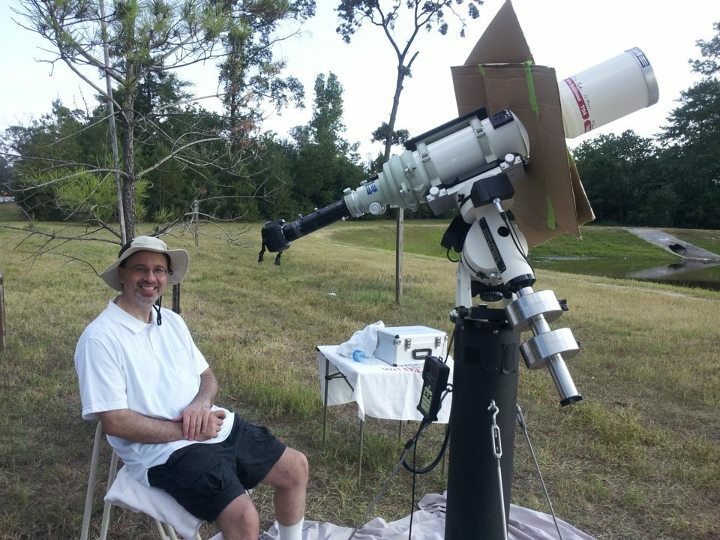 My wonderful wife captured this shot of the transit setup on her cell phone camera. Check out the high-tech cardboard box sun shields! A Bad Picture of the Moon? More Venus! 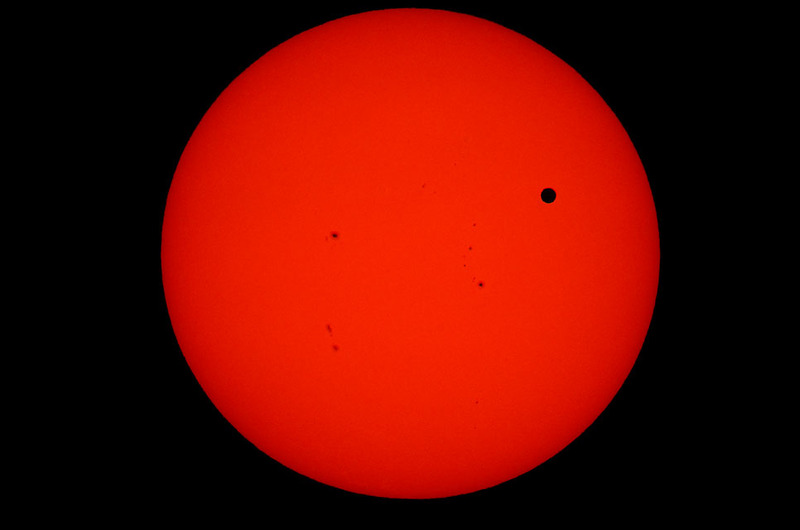 No, it's a shot of Venus in broad daylight. Like the moon, Venus has phases and was 1.14% illuminated when shot at 5:30 p.m. on 3/24/2009, about 3 hours before local sunset.